Is love just chemistry? At what point does depression become an illness? Are drug-induced feelings less real? Is memory integral to identity? Is it even possible to use the human mind to explore the human mind? The Effect, Lucy Prebble's brainy new play for the National Theatre and Headlong, throws such imponderables around with exhilarating abandon from start to finish, but that's not the main reason to see it. 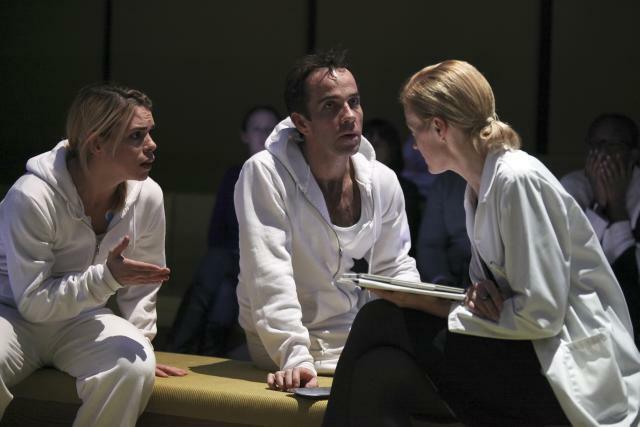 The real brilliance of this complex work is in its quick-fire dialogues, which at their best make for gripping theatre – often funny, occasionally terrifying, usually thought-provoking and always flawlessly acted by Billie Piper, Jonjo O'Neill, Anastasia Hille and Tom Goodman-Hill. Expectations were high. Prebble's last play Enron – a brazenly entertaining satire about the company whose bankruptcy rocked corporate American in 2001 – became a surprise West End hit and even transferred to Broadway. Set in the small Cottesloe Theatre at the National's South Bank base, The Effect shares Enron's humour, its antipathy to business and its willingness to engage with daunting subject matter. But it’s altogether more intimate, open-ended and difficult. This would be an even more surprising West End hit, masterful though it is. The intimacy is calculated in a play about a girl and a boy (Piper and O'Neill) who are confined in a drug-testing centre on a scientific experiment. Guess what happens? Yup, they fall in love. Is it the anti-depressant they are given or just ‘nature’? That’s what the brain doctors (Hille and Goodman-Hill) are out to test – but not what Prebble is out to explore. She’s more interested in debunking the very question and showing how scientific objectivity might be undermined by a doctor’s commercial or emotional agenda. The experimenters themselves become subjects of the experiment. So, by extension, do the audience members, many of whom Prebble has seated on stage, implicitly within the clinic. Is this play itself an anti-depressant that we take to conceal our fear of death? Is director Rupert Goold sitting up in the gods monitoring our laughs with a clipboard? If all this self-reflexivity sounds adolescent and tendentious, that’s not how it comes across. There were longueurs in a disturbing grave-digger sequence involving a brain rather than a skull. But most of the play is surprisingly dramatic. A falling-in-love scene on a magical mosaic floor was nothing short of brilliant. Is it a problem that this brilliance is more in individual episodes, particularly early on, than in the play as a dramatic whole? Perhaps. We had definitely come down from our theatrical high by the time the play ended in a cold shower of repeated sentences and basic feelings reminiscent of Samuel Beckett. But that may be the point - from love, elation and depression to hunger, masturbation and, in the song that concludes the show, just breathing. The Effect runs at the National Theatre until 23rd February. Returns and day tickets only.